Posted June 3rd, 2014 - News Posted for South Africa News, World Surfing News. Umdloti, Durban, South Africa – The second leg of the Quiksilver Takes One To Know One Series was held in contestable three foot surf at the weekend. Over 90 of the country’s top surfers converged on Umdloti’s south point for the Surfing South Africa 3A PST-rated event that catered for both Open Men and U20 Pro Junior boy’s divisions. Umhlanga’s Beyrick De Vries put on a solid performance to win the Men’s division. De Vries impressed the judges by selecting the biggest wave and pulled off two radical maneuvers to post the highest score in the twenty-five minute final. “Paddling out in the final I knew that it would come down to who caught the best wave as the other three surfers are more than capable of posting excellent rides given the opportunity. I am really stoked to win an event in my hometown. This win will boost my confidence for upcoming events overseas,” said De Vries. 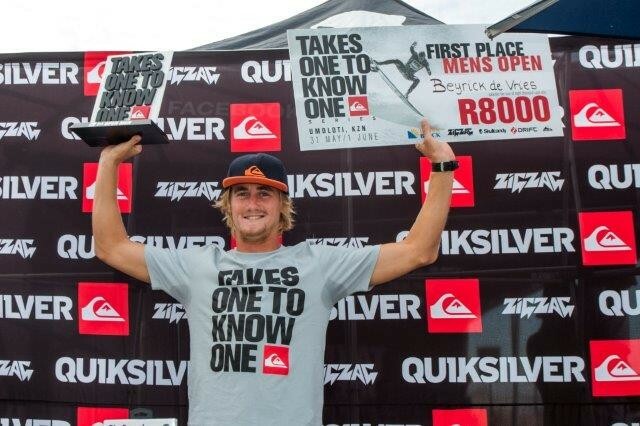 Second place was claimed by Brandon Jackson (Durban North), with Casey Grant (Scottburgh) third and Daniel Redman (Durban North), a finalist at the first Quiksilver Takes One To Know One series event, taking fourth place. In the Under 20 Pro Junior Final Diran Zakarian (Melkbosstrand) got off to a flying start and took an early lead over his fellow competitors. Zakarian then continued to build on his lead with an impressive late drop take off and tube ride which earned an excellent 8.25-points score that secured him the win. Slade Prestwich (Durban North), one of the contest’s stand-outs, finished second. Dylan Lightfoot (Jeffreys Bay) was third and Mikey Venter (Warner Beach) finished in fourth position. Zakarian was also awarded the “Skullcandy Performance Award” for his impressive aerial surfing and tube riding . Winners and finalists took home prizes from sponsors Drift HD Camera’s, Techniblock Sunscreen, Skullcandy headphones and Zigzag Surfing Magazine. The last remaining event in the Quiksilver Takes One To Know One Series will be held at Victoria Bay in September. For more information, photos and videos on the event and series, please visit the official event website: www.quiksilver.co.za/totko. The Quiksilver Takes One to Know One Series is sanctioned by Surfing South Africa. All three events in the Series are part of the SSA Pro Surf Tour. Surfing South Africa is a member of the South African Confederation of Sport and Olympic Committee (SASCOC) and is recognised as the governing body for the sport by SASCOC. SSA is a member of the International Surfing Association (ISA), the World govering body for the sport.